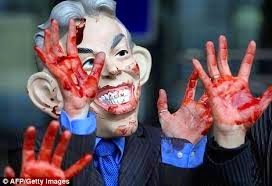 Nearly twelve years since the conflict began, the Iraq war is still controversial, with many believing that Tony Blair and George W. Bush launched an ?illegal war?. For these critics, the only satisfying result would be the trial of Bush and Blair on war crimes charges. I think this will happen one day ? on the condition that the jury consists of flying pigs. (Perhaps they flew off with the mythical weapons of mass destruction). For now, then, in light of the mysterious death of a scientist and the dubious delay in a planned investigation of the war, critics of the conflict have to litigate these issues indirectly. There is a link to EU law here ? as set out in yesterday?s Shepherd judgment of the CJEU. Unfortunately that judgment is highly problematic, not because the Court avoids the key issue of the war?s legality, but because of its unconvincing interpretation of some key issues concerning the status of deserters in EU asylum law. The Geneva Convention on refugee status defines a refugee as a person outside his or her country of origin, who is unwilling or unable to return to that country due to a well-founded fear of persecution on grounds of race, religion, nationality, particular social group or political opinion. But it excludes refugee status from those who have committed particularly heinous acts, including war crimes. These rules are set out again, and further elaborated, in the EU?s Qualification Directive. In particular, there is a further definition of the concept of ?persecution?, which (among other things) includes legal or policing measures, or prosecution or punishment, which is ?disproportionate or discriminatory? (the ?unfair punishment? rule), and ?prosecution or punishment for refusal to perform military service in a conflict?, if ?performing military service would include crimes or acts falling under the exclusion clauses? (the ?military service? provision). The Shepherd case concerns an American soldier who developed doubts about the legitimacy of the Iraq war. Although he was not in combat, but rather carried out maintenance work on helicopters, he feared that he was contributing to the commission of war crimes. So he deserted from the US army, but expected that he would be prosecuted in the USA as a result. To avoid this, he applied for asylum in Germany, and the German courts sent questions to the CJEU to clarify the interpretation of the Qualification Directive. The Court began by confirming that it would only interpret the rules in the Directive on the concept of persecution, although the Advocate-General?s opinion had also examined the rules on the grounds of persecution and exclusion. As a result, the Court?s judgment says nothing (for instance) about the definition of ?war crimes?. Next, the Court made four main points about the interpretation of the ?military service? provision. First of all, the definition of ?military service? included support staff, and the circumstances surrounding enlistment in the military were irrelevant. Implicitly it doesn?t matter whether the soldier was conscripted or volunteered. However, the Court stated that being part of the military was a ?necessary but not sufficient? condition for the rule to apply. Secondly, the Court elaborated upon the conditions for applying the provision, setting out four elements to be considered: there must be a relationship with an actual conflict; the rule can apply even to indirect participation in a conflict, if the soldier?s tasks could ?sufficiently directly and reasonably plausibly, lead them to participate in war crimes? (the possibility of prosecution before the International Criminal Court being irrelevant); there must be a likelihood of war crimes being committed in future (again, the possible role of the International Criminal Court is irrelevant); and the past conduct of the unit is not an automatic indicator that war crimes will be committed in future. Overall, the test is whether ?there is a body of evidence which alone is capable of establishing? whether it is ?credible? that war crimes will be committed. Thirdly, the Court examined the context of the conflict in question, addressing three issues. If there was a Security Council resolution authorising the conflict, there was ?in principle, every guarantee? that war crimes will not be committed, although this was not an absolute rule. This also applied to an ?operation which gives rise to an international consensus?. And if national law of the country of origin provided for the ?possibility? of prosecution of war crimes, then it was ?implausible? that such crimes will be committed. Overall, the asylum-seeker has to show that there is ?sufficient plausibility? that his unit is ?highly likely? to commit war crimes. Fourthly, the Court looked at the soldier?s individual circumstances. Desertion has to be the only way in which he could avoid participation in war crimes, and the Court pointed out that Mr. Shepherd had enlisted and then re-enlisted in the US armed forces. Finally, the Court interpreted the ?the ?unfair punishment? rule. The starting point was that Member States are entitled to maintain an armed force, including by means of punishing soldiers who desert. A penalty of up to five years in prison was not disproportionate, in the CJEU?s view. Nor was Mr. Shepherd?s punishment discriminatory, since there was no comparator for him. And the social ostracism that might result from his desertion was legally irrelevant, since it was only a consequence of the punishment. Let?s begin with the parts of the judgment which are fairly convincing. The Court?s definition of ?military service? makes sense in light of the wording of the Directive, as does its interpretation of the conditions for applying this provision. Unfortunately, the majority of the Court?s reasoning is not as persuasive. As regards the ?unfair punishment? rule, the Court should have made clearer why a lengthy prison sentence is acceptable for a deserter, but not (according to prior case law) an LGBTI refugee. (The obvious answer is that an expression of human sexuality is prima facie an exercise of the human right to a private life). On discrimination, the Court?s failure to find a comparator stems from its unwillingness to look at the grounds of persecution: obviously Mr. Shepherd could claim discrimination as compared to persons in other social groups or holding other political opinions. And as for social ostracism, the Court simply asserts that such ostracism cannot be severed from the punishment for desertion. But this is not necessarily correct. However, it should be noted that the judgment leaves open the possibility that social ostracism can exist in the absence of official punishment in another case. The Court?s reasoning on the context of military conflict is quite implausible. Why should the mere existence of a Security Council resolution amount to a ?guarantee? that war crimes will not be committed? In any event, this begs the enormous question as to whether the Iraq war was indeed authorised by such a resolution. This line of reasoning is inconsistent with the Court?s ruling in the Kadi line of cases that the mere existence of a Security Council process was insufficient to guarantee human rights. Many people start out as naive idealists about international law, but end up as disappointed cynics; the Court seems to have undertaken this journey the other way around. The idea that an ?international consensus? could lead to the same result is baffling. Unlike a Security Council resolution, which is clearly a real thing (leaving aside the question of how to interpret one), there is no reference to ?international consensus? in the Directive, and the Court makes no suggestion that such a concept exists in international law. How would it even be defined? The State being invaded clearly does not participate in such a ?consensus?, and if there were such widespread international agreement, why would it not have resulted in a Security Council resolution anyway? The only plausible explanation for this part of the judgment is that Tony Blair hacked into the Court?s computer system, integrating his beliefs about liberal intervention into the heart of EU law. Let?s hope he didn?t charge the Court his usual fee. Nor is it convincing that the ?possibility? of national prosecution for war crimes is sufficient. If it were, why has the international community spent decades building an international criminal court system? The Advocate-General?s opinion gives several examples (such as My Lai) where such a possibility was clearly insufficient. - Holocaust Denial And Hate Crime: Can The Eu And Its Member States Do More?